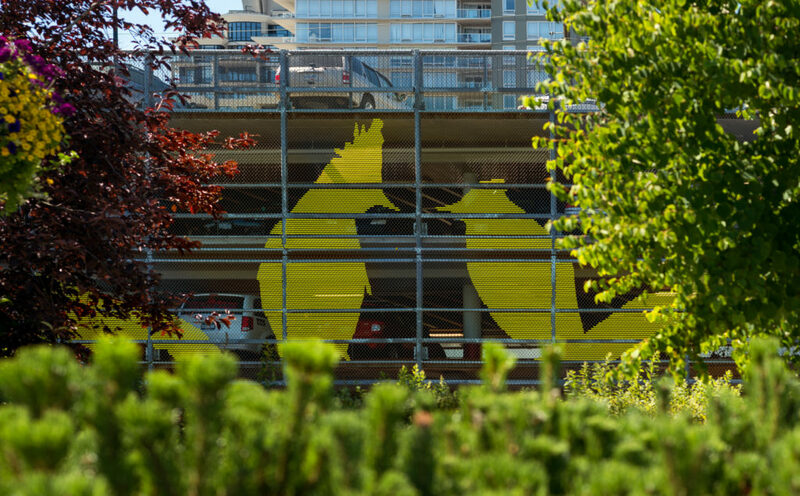 The bird’s the word around New Westminster’s Front Street Parkade this summer, thanks to a recent work by artists Jacqueline Metz and Nancy Chew. 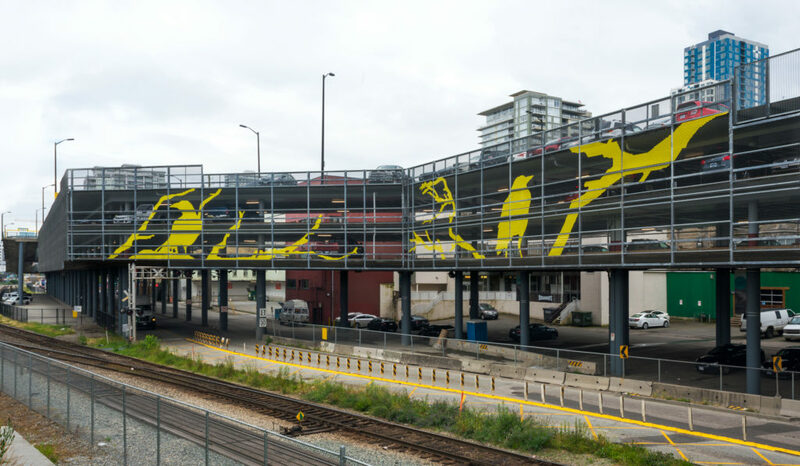 Collectively known as Metz & Chew, the duo responded to an open call from the City of New Westminster for a public art installation with hopes of completing their first large-scale, urban project. In the past, their work has been much more intimate, making the notion of seeing 660 feet of their own art open to the public an exciting creative challenge for the collective. Image used with permission by photographer Michael Love. The concept of birds on a branch was inspired by the historic metropolitan area, nearby riverfront walk, heritage homes, and lavish gardens that are truly unique to New Westminster. As a “playful counterpoint to the industrial facade of the parkade,” the piece is lighthearted while remaining meaningful to anyone who’s known or visited the riverside community. Even the ideas for the appearances of the birds depicted in the work originate from the birdsong that can be heard in nearby forests and gardens, although their specific shapes and sizes are purely suggestive. Anyone travelling via Skytrain will be able to spot birds on a branch on their commute from the Skybridge, but locals will likely pass it by as part of their regular routine. To get an especially picturesque view of the piece, stroll through Westminster Pier Park and peek through the greenery to see the stark yellow birds residing on the building side. Image used with permission of the photographer Michael Love. 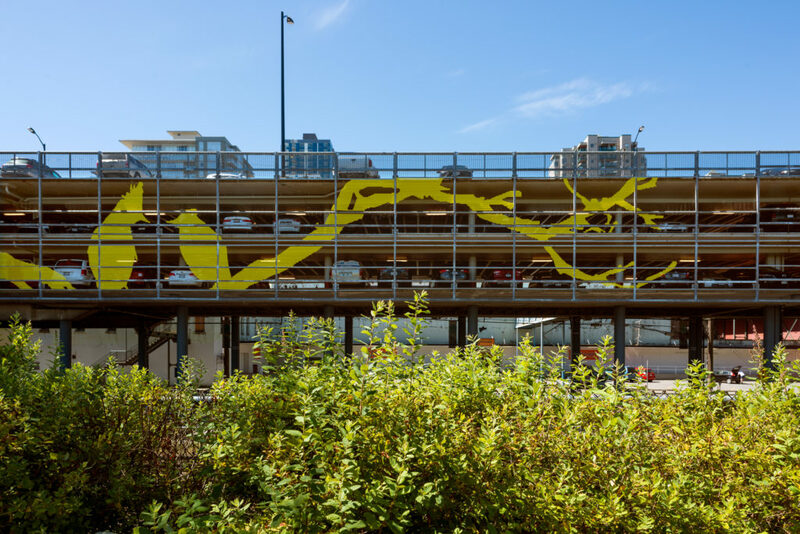 The bold yellow colour of the piece, deemed “parkade lemonade”, was chosen as a sunny, optimistic hue that will stay vibrant throughout the seasons. It sticks out beautifully on the chain-link of the Front Street Parkade—described as Metz & Chew as an almost glowing effect from inside the structure. Because of its size, it can be seen as abstract both close up and from a distance. birds on a branch will be officially revealed to the public at a Fridays on Front event on the Front Street Mews on July 7 at 5:00pm. The event will lead attendees on a public art tour of the City’s recently completed public creations, and a flock of white doves will be released to celebrate the finalization of birds on a branch. Metz & Chew will be in attendance and will speak at the event. Arts Coordinator for the City of New Westminster, Biliana Velkova, has been organizing the city’s public art project since it began. She is thrilled to have worked with Metz & Chew, and is looking forward to the seeing their work around the city. “They were really creating something really unique and special for the city, which I think they achieved with birds on a branch. We needed to add some colour and something playful on the structure, which also plays with the overall beautification and building installation in the area,” says Velkova. Image used with permission of the photographer, Michael Love.